Let's say your CIO stops by one day and asks you, "What if we are hit by an unforeseen disaster tomorrow? Do you have the confidence to be able to run our critical applications on the recovery site, and guarantee that our users will be able to connect to their apps and conduct business as usual?" Note that your CIO is not going to ask you about just recovering your servers or virtual machines, the question is always going to be about recovering your applications successfully. So why is it that many cloud migration and disaster recovery offerings stop at just booting up your servers, and offer no promise of actual end to end application recovery? What makes Azure Site Recovery different that allows you as the business continuity owner to sleep better? A typical enterprise application comprises of multiple virtual machines spanning different application tiers. These different application tiers mandate write-order fidelity for data correctness. The application may also require its virtual machines to boot up in a particular sequence for proper functioning. A single tier will likely have two or more virtual machines for redundancy and load balancing. The application may have different IP address requirements, either use DHCP or require static IP addresses. Few virtual machines may require a public IP address or DNS routing for end user internet access. Few virtual machines may need specific ports to be open or have security certificate bindings. The application may rely on user authentication via an identity service like Active Directory. To recover your applications in the event of a disaster, you need a solution that facilitates all of the above, gives you the flexibility to potentially do more application specific customizations post failover or migration, and do everything at an RPO and RTO that meets your business needs. Using traditional backup solutions to achieve true application disaster recovery is extremely cumbersome, error prone and not scalable. Even many replication based software only recover individual virtual machines and cannot handle the complexity of bringing up a functioning enterprise application. Azure Site Recovery combines a unique cloud-first design with a simple user experience to offer a powerful solution that lets you recover entire applications in the event of a disaster. How do we achieve this? With support for single and multi-tier application consistency and near continuous replication, Azure Site Recovery ensures that no matter what application you are running, shrink-wrapped or homegrown, you are assured of a working application when a failover or migration is issued. Many vendors will tell you that having a crash-consistent disaster recovery solution is good enough, but is it really? With crash consistency, in most cases, the operating system will boot. However, there are no guarantees that the application running in the virtual machines will work because a crash-consistent recovery point does not ensure correctness of application data. As an example, if a transaction log has entries that are not present in the database, then the database software needs to rollback until the data is consistent, in the process significantly increasing your RPO. This will cause a multi-tier application like SharePoint to have very high RTO, and even after the long wait it is still uncertain that all features of the application will work properly. To avoid these problems, Azure Site Recovery not only supports application consistency for a single virtual machine (application boundary is the single virtual machine), we also support application consistency across multiple virtual machines that compose the application. Parallelism and sequencing of virtual machine boot up to ensure the right recovery order of your n-tier application. 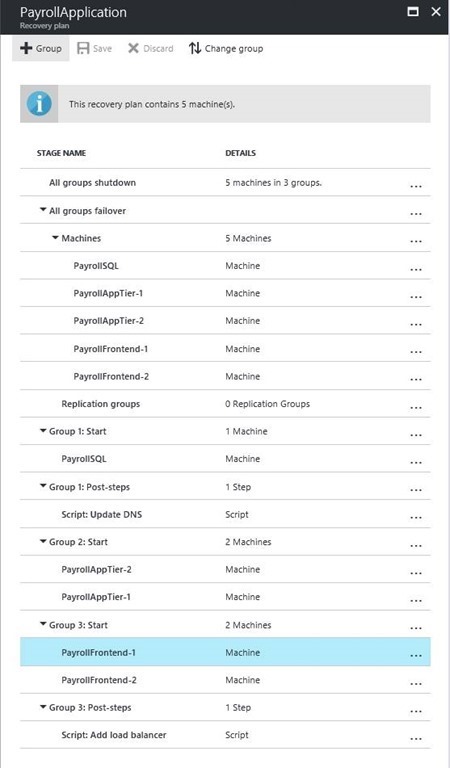 Integration with Azure Automation runbooks that automate necessary tasks both outside of and inside the recovered virtual machines. The ability to perform manual actions to validate recovered application aspects that cannot be automated. Your recovery plan is what you will use when you push the big red button and trigger a single-click stress free end to end application recovery when needed, with a low RTO. Another key challenge for many of these multi-tier applications to function properly is network configuration post recovery. With advanced network management options to provide static IP addresses, configure load balancers, or use traffic manager to achieve low RTOs, Azure Site Recovery ensures that user access to the application in the event of a failover or migration is seamless. A common myth around protecting your applications is the fact that many applications come with in-built replication technologies - hence the question, why do you need Azure Site Recovery? So, you ask, what does this really mean? Azure Site Recovery provides you with powerful disaster recovery application orchestration no matter whether you choose to use its built-in replication for all application tiers or mix and match native application level replication technologies for specific tiers, e.g. Active Directory or SQL Server. Enterprises have various reasons why they may go with one or the other replication choice, e.g. tradeoffs between no data loss and cost and overhead of having an active-active standby deployment. 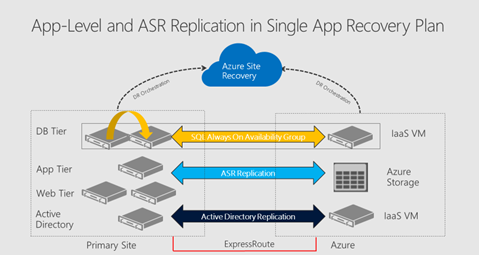 The next time you get asked, why do you need Azure Site Recovery when say you already have SQL Server Always On Availability Groups, do make sure you clarify that having application data replicated is necessary but not sufficient for disaster recovery, and Azure Site Recovery complements native application level replication technologies to provide you a full end to end disaster recovery solution. We have learnt from our enterprise customers who are protecting hundreds of applications using Azure Site Recovery, what the most common deployment patterns and popular application topologies are. So not only does Azure Site Recovery work with any application, Microsoft tests and certifies popular first and third-party application suites, a list that is constantly growing. 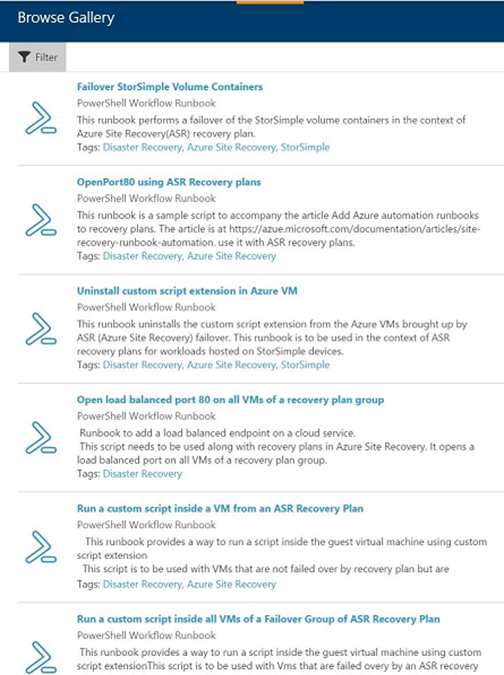 As part of this effort to test and provide Azure Site Recovery solution guides for various applications, Microsoft provides a rich Azure Automation library with production-ready, application specific and generic runbooks for most common automation tasks that enterprises need in their application recovery plans. An application like SharePoint typically has three tiers with multiple virtual machines that need to come up in the right sequence, and requires application consistency across the virtual machines for all features to work properly. Azure Site Recovery solves this by giving you recovery plans and multi-tier application consistency. Opening a port / adding a public IP / updating DNS on an application’s virtual machine, having an availability set and load balancer for redundancy and load management, are examples of common asks of all enterprise applications. Microsoft solves this by giving you a rich automation script library for use with recovery plans, and the ability to set up complex network configurations post recovery to reduce RTO, e.g. setting up Azure Traffic Manager. Most applications will need an Active Directory / DNS deployed and use some kind of database, e.g. SQL Server. Microsoft tests and certifies Azure Site Recovery solutions with Active Directory replication and SQL Server Always On Availability Groups. Enterprises always have a number of proprietary business critical applications. Azure Site Recovery protects these with in-built replication and lets you test your application’s performance and network configuration on the recovery site using the test failover capability, without production downtime or replication impact. With relentless focus on ensuring that you succeed with full application recovery, Azure Site Recovery is the one-stop shop for all your could migration and disaster recovery needs. Our mission is to democratize disaster recovery with the power of Microsoft Azure, to enable not just the elite tier-1 applications to have a business continuity plan, but offer a compelling solution that empowers you to set up a working end to end disaster recovery plan for 100% of your organization's IT applications.